Women march in a procession to celebrate the 25th anniversary of proclaimed independence in the capital Hargeisa, Somaliland, a breakaway region of Somalia, May 18, 2016. People, cattle, camels, donkeys and even a lion dressed up in Somaliland’s red, white and green flag colors for parades and celebrations Wednesday marking 25 years since Somaliland’s self-declared independence from the Federal Republic of Somalia. 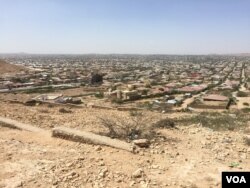 But to the international community, Somaliland is not recognized as a country, even though it has called itself independent since 1991, following a three-year civil war with Somalia. Somalia has refused to recognize that independence but has afforded the region autonomy. Somaliland has its own government and military and a separate currency. It holds elections and even has a national passport, although travel can often be difficult on an unrecognized country’s documents. And unlike their southern neighbors, Somalilanders enjoy relative security. 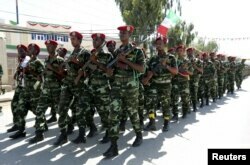 Soldiers participate in a military parade to mark the 24th self-declared independence day for the breakaway Somaliland nation in the capital Hargeysa, May 18, 2015. 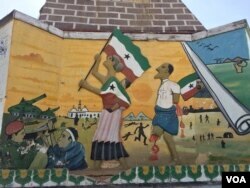 For these reasons, Ahmed argues that Somaliland has earned its right to statehood. But University of Minnesota professor Abdi Samatar says the international community has reasons for not recognizing Somaliland. Despite its gains, Somaliland is not perfect, says Samatar. A territorial dispute between Somaliland and Puntland continues over the provinces of Sool, Sanaag and Cayn. Somalilanders suffer from high unemployment rates, and many are still risking the dangerous trip across the Mediterranean to illegally migrate. And according to Samatar, there’s yet another problem. Acknowledging the current security challenges faced in Mogadishu and other parts of Somalia, Samatar argues that Somalis are still better off as one larger block than separate, smaller ones. “And so, jointly putting their resources together, they will be at a greater advantage to compete with Ethiopia, and Kenya, rather than become different principalities,” Samatar said. Before 1960, Somalia was divided by colonial powers – the British controlled the northern protectorate of Somaliland, while the Italians were in charge of what is now the Federal Republic of Somalia. 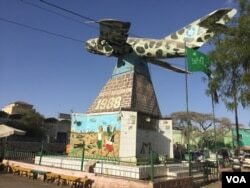 In June 1960, Somaliland gained independence from Britain, and five days later, the two former colonies united as the United Republic of Somalia. This arrangement lasted until civil war broke out in 1988.